Samsung has a new A series phone. This time, unlike previous releases, the Samsung Galaxy A40 was launched in the Netherlands. The phone is rumored to launch globally on April 10 alongside the Galaxy A90 with a pop-up camera, but it’s already available for preorder on Dutch online store Belsimpep for €249, which translates to roughly P14,891 or $283 converted. If the Galaxy A40 does find its way to the Philippines next month or later this year, it might sell for P14,990 ($285) locally, which would reflect its positioning in the company’s updated A lineup. Last week, Samsung launched the Galaxy A30 and Galaxy A50 in the Philippines with palatable P13,990 ($266) and P17,990 ($343) price tags, respectively. On the outside, the smartphone seems to have a glossy plastic back with gradient coloring on the surface. It also has a dual-camera array and a physical fingerprint scanner just above the Samsung logo. The screen is wrapped with small bezels to keep the design relatively small, portable, and comfortable to hold. 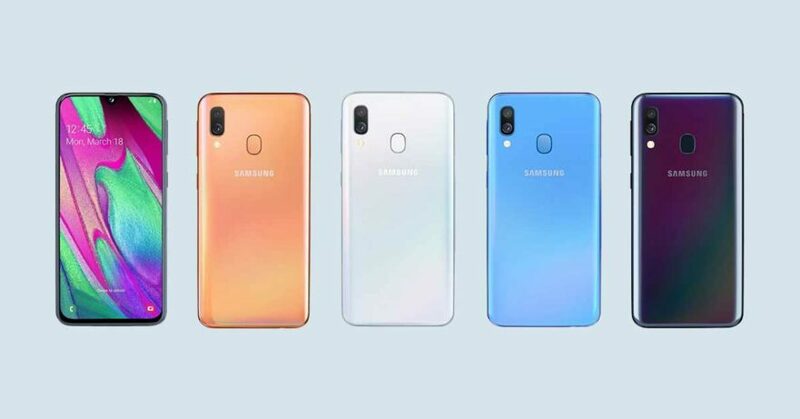 As per the online listing, the Samsung Galaxy A40 features 5.9-inch full HD Super AMOLED display with a small round notch at the top. It runs Android 9.0 Pie on top of Samsung’s own One UI and powered by an Exynos 7885 processor coupled with 4GB RAM and 64GB of expandable storage. It also packs a 3,100mAh battery that supports fast charging via a USB-C port. As for the cameras, there’s a 16-megapixel, f/2.0 main camera paired with a 5-megapixel ultra-wide-angle option. The single front-facing shooter is 25 megapixels, which indicates selfies should come out nice and crisp with little noise.